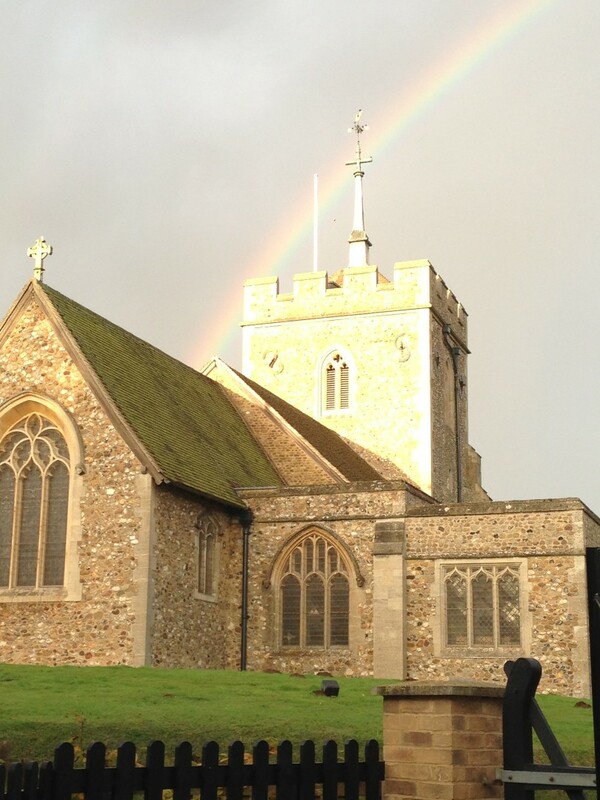 For all of us, St Ippolyts Church has a very real presence in our lives. We see it almost daily in its fantastic position at the top of the hill. It is one of the few buildings that, if it were suddenly wiped out, we would all notice that it had gone, and we would miss it. Most of us, church-goers or not, consider it to be ‘our’ church. We may only be referring to the building if we belong to a different church or faith, or do not have a faith; but we would still notice if it wasn’t there. I think that most of us would be sad. It is this feeling for the bricks and mortar that I am addressing now. Many people think that the Government, or the Archbishops of Canterbury and York, or our Bishop Alan of St Albans are responsible for, and look after St Ippolyts Church. Unfortunately, that is not the case. Apart from grants, which are incredibly difficult and complicated to get, we, here in St Ippolyts, must look after and maintain our church ourselves. It is very costly, as all repairs to a grade 1 listed building like ours have to be done in such a way as to keep to the original look of the church and to a specification laid down by the church architect and the bishop’s advisers. Frankly, our dwindling and ageing church congregations are finding this more and more difficult to do. We are therefore looking beyond our congregations to those people who are well disposed to the church building at the top of the hill, and who do not want it to disappear. One of our church fundraisers is a ‘100’ club. This was started in 1990 by Jean Williams and has raised money for the church fabric ever since. As usual with 100, 200, etc clubs, half the money subscribed goes into prizes for the participants and half goes towards the repair and maintenance of the ‘fabric’ of the church. 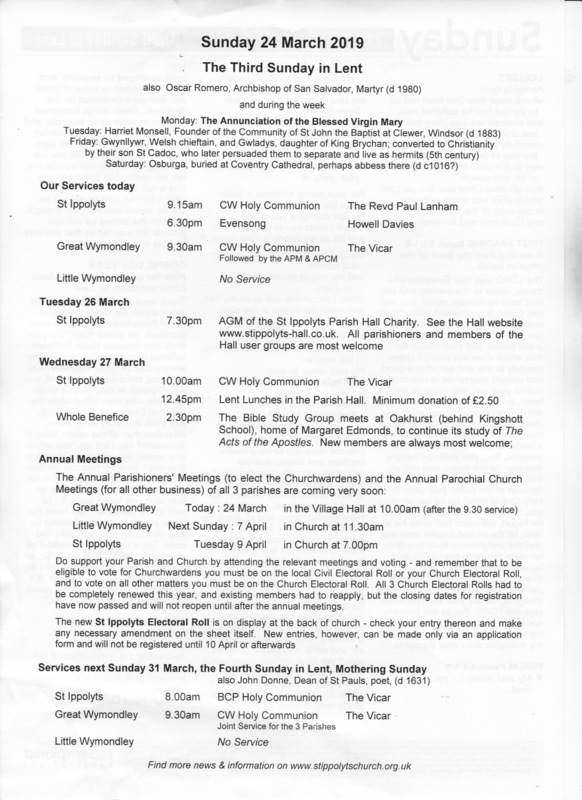 During that time there have been many calls on the money; new roofing on the tower and the nave, repairs to the buttresses, rebuilding the wall opposite the school, resurfacing the path from the lych gate to the church – and many more. The money has always been put to good use. Gradually, over the years, the club has grown from less than 100 members to nearly 150. Shortly before Jean died I took over the running of the club from her, and we discussed the way forward. She and I were both very keen to expand the club – hopefully to 200 members, but with 250 or 300 a dream. This is why I am writing this article. If you have a soft spot for the church on the hill and would like it still to be there for you, your children and grandchildren for many years, please would you join us? The subscription is £10 per year per number. Half of the monies that come in are distributed back in modest prizes, and there is no limit to the number of tickets you can hold. Over the years some couples have bought new subscriptions on a fairly regular basis as the grandchildren arrive! An application form can be found on this web site and when filled in should be returned to Shelagh Cox, 6 Ransom Close, Hitchin, SG4 9AX. If you have queries and would like to phone me, my phone number is 01462 432445. We are a friendly village church community of all ages. 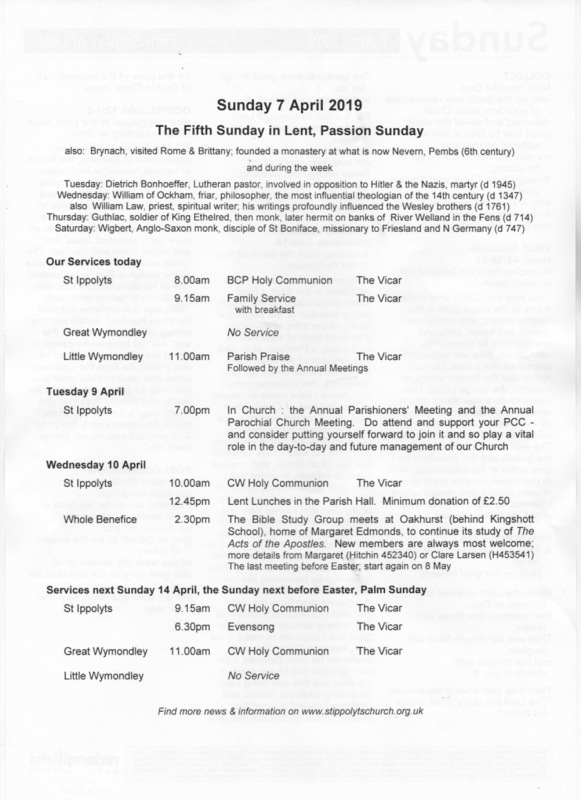 Our services range from the traditional Book of Common Prayer Holy Communion, Evensong and the occasional Mattins to Common Worship, Sung Eucharist and All Age Non- Eucharistic and Toddlers' services. 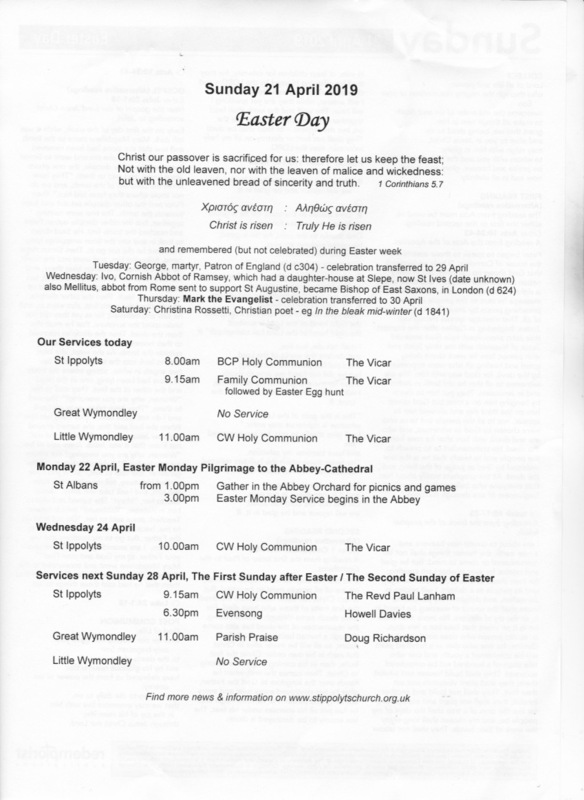 We share a Vicar with our neighbouring parishes of Great and Little Wymondley, and several times a year combine with these churches for special joint services. Our Church building is very well loved by the village and being a pretty church on a hill in lovely surroundings we are often chosen by brides for their wedding day (see weddings page). We host several weddings each year, always a happy occasion for the couple, the church and the village community. There has been a church on this site for at least 900 years; the church building is dedicated to St Ippolyts, so our patronal festival day is August 13th the day dedicated to St Hippolytus (see the article about St Hippolytus). 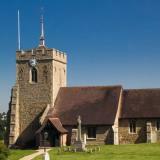 The Ecclesiastical parish of St Ippolyts includes the villages of St Ippolyts, Gosmore and Langley. The village of St Ippolyts is just outside Hitchin on the B656 road to Codicote and the church can be accessed from this road or from the A602 to the south of Hitchin. The church is visible from the B656, just under two miles from Hitchin and is floodlit at night so easy to spot. From the A1M come off at junction 8 and take the A602 to Hitchin, there are two very narrow lanes on the left hand side that are signposted to St Ippolyts. If you prefer to stay on the main road simply continue and take the first exit at the roundabout, continue straight on at the mini roundabout, and then take the next left (just after the pedestrian crossing). For Sat Nav users the postcode is SG4 7PB and the road name is Ashbrook Lane. Watch out for the alternative spelling of our village on some signposts - St Ippollitts. 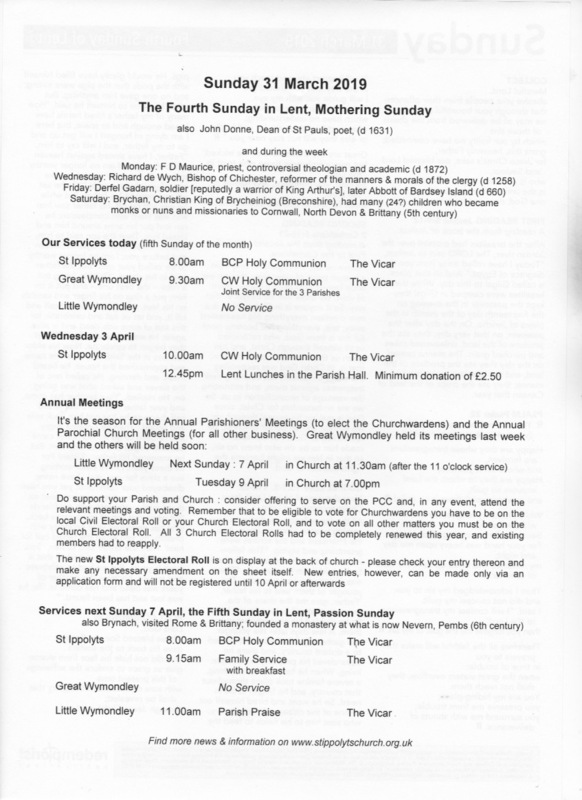 Holy Week in the Benefice. LENT UPDATE - How is your Lent going? A thought from Revd Ginni.